Xavier Mula was born in Igualada (Barcelona-Spain) in 1983, son of a illustrator, publicist and graphic designer. Currently, it takes almost six years dedicating professionally illustration and working for publishers, design studies, newspapers, magazines, local governments and the world of adeversiting. Besides he’s a teacher of art and design in Gaspar Camps art school since 2015. 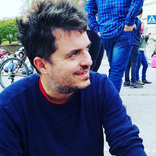 Also, his CV includes national and international awards in illustration, among others, the recent Laus Gold 2014 (Spain), the Museum and the Web Award 2014 (USA) and the Junceda Award 2014 (Spain) or the selection at Catalogo Iberoamericano de Ilustración 2016 (Mexico). In parallel, he does and participates in numerous group and solo exhibitions around his country. Xavier works with mixed media, usually starts his illustrations with acrylics and stamping, finishing using digital tools, to get his characteristic and own way of expression through a powerful language, always with the main purpose of transmitting by the best possible way the concept and the message of the illustration, without forgetting the beauty and appeal of his artwork.